Biblio, Inc., which operates Biblio.com, today announced the launch of its new UK website, Biblio.co.uk. While Biblio.com is one of the largest used book marketplaces in the world and carries books from independent booksellers in over 40 countries, Biblio.co.uk will be primarily focused on serving European customers who are looking for second hand and antiquarian books specifically from the UK or other parts of Europe. The new site seeks to differentiate itself from other UK second hand book marketplaces by serving this more regionally-minded market. Most books listed on the site will originate from the UK and Europe, with select specialists and antiquarian dealers from other regions who have inventory of particular interest to European customers. General trade titles shipping from outside of Europe will generally be discouraged. "We think focusing on the quality of selection over quantity of selection gives us an important competitive advantage in this market," says Biblio CEO, Brendan Sherar. "We believe most UK customers prefer to shop for secondhand books from within their own country and Europe, and tend to purchase abroad only when the title is not available locally." The idea of buying "local" is a key concept for Biblio.co.uk, according to Allen Singleton, chief operating officer at Biblio. "People in the UK are even more aware of their carbon footprint than we are in the U.S. The choice to order from UK booksellers rather than overseas can result in a much lower environmental impact." The term "carbon footprint" refers to the amount of CO2 emissions a person or organization's daily operations causes. Through a partnership with Native Energy, Biblio.com purchases carbon offsets in exchange for its own emissions, including all book shipments, as will Biblio.co.uk. These offset purchases in turn fund projects such as developing sustainable alternative energy. 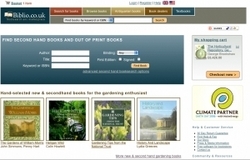 In addition to offering an European-centric selection of books, Biblio.co.uk also introduces expanded secure online payment options for European customers, including Maestro, Switch, Solo, and Electron, and the ability for them to opt to pay for their purchases in British pounds, Euros, or U.S. dollars. Biblio, Inc's flagship product, Biblio.com, is one of the world's leading sources for textbooks, used books, and rare books. Established in 2003, Biblio.com has grown to become the largest independently owned book marketplace in the world, with over 50 million books for sale from 5500 independent booksellers. Based in Asheville, North Carolina, Biblio, Inc. is a privately held company with a commitment to a triple bottom line, through its work with Biblio Charitable Works, Inc and its carbon offsetting program in partnership with NativeEnergy. For more information, please visit http://www.biblio.com or http://www.biblio.co.uk.